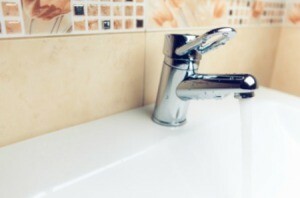 Removing rust stains from sinks and tubs can be difficult. This guide is about pink stains in sinks and bathtubs. We have well water and it seems to have a high iron content. All around my sinks there are pink stains. Does anyone know what will remove them? So far Lime-Away hasn't worked. To get totally rid of the pink stains around sinks and tubs use OXI CLEAN. It really works. We also have well water with lots of iron in it. The only thing I have found that even touches it it a product called ZUD. It comes in a conatiner like Comet cleanser but it works much better on those iron stains. Just dampen the area, sprinkle the ZUD generously and let sit for a few minutes then scrub it all off with a cloth and rinse it away. If you are looking for a good commercial product the Works brand works really well for me on stubborn toilet, sink and tub stains, especially iron. Here is my collection of tips to remove rust. We have high iron content in our well water. Despite our water conditioner, a certain amount gets through. There are different kinds of rust stains, so not all solutions will work on all rust stains. The best products I have tried are Zud, Iron Out (powdered form) and Whink. I've also had good luck with a product named Zap. Most of these can be found at Walmart or other discount stores that sell cleaners. Use tooth paste on an old toothbrush to rub them off. Use the paste type, not the gel type. 1. A can of Coke soaked overnight will remove rust stains in showers, toilets and sinks. 2. Take an old towel, and put it over the stain, and soak it with hydrogen peroxide, and let it sit overnight. When you pick up the towel, the stain will be gone. 3. Lay a paper towel down on the tub, sink, etc. and then soak it with vinegar and leave it for about an hour. 4. To get rust stains out of sinks and around drains, use NAVAL Jelly, which can be found in the automotive section. 5. Pour a pile of table salt on top of the rust spot and then squeeze lemon juice over it. Let this pile of salty lemon juice sit for several hours, overnight or longer. This will draw the stain out and you can actually see the rust in the pile of salt.